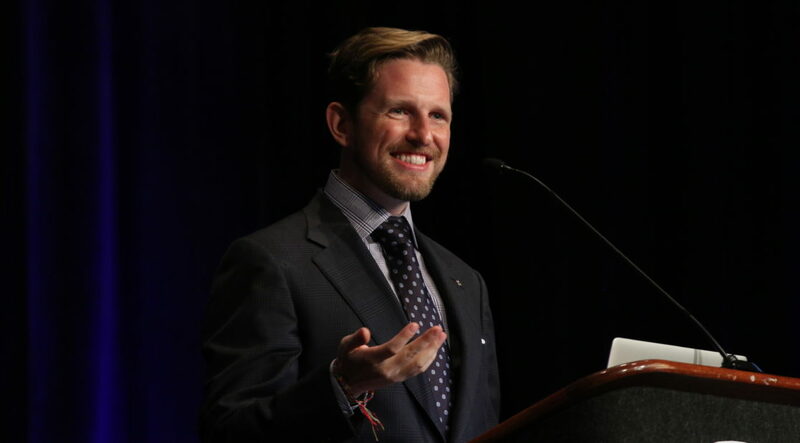 Matt Mullenweg just completed the 2016 State of the Word, which highlights the accomplishments of the past year, and sets the direction for the year ahead for WordPress. Matt Mullenweg just completed the 2016 State of the Word presentation at WordCamp US 2016. This year, Matt focused on a variety of important topics, including the state of user experience in WordPress today, goals for future interface improvements, a WordPress growth council, internationalization gains, the further proliferation of secure websites, and important changes to the WordPress development process. Matt began his talk by thanking the city of Philadelphia for being a great host of the first two WordCamp US events, as well as the sponsors, organizers, and volunteers that helped make WordCamp US one of the most successful and smoothest run WordCamps ever. He also said the per person cost for WordCamp US is over $500 per person, and that only the sponsors make that happen. And next year, WordCamp US is making its way to Nashville. There were 116 WordCamps in 2016, and over 36,000 attendees, 2,056 speakers, 1,036 sponsors, and 750 organizers. There were 3,193 meetup events in 58 countries. These were attended by more than 62,000 people, or nearly double WordCamps. Matt says it’s the fastest growth there has been for these events in around five or six years. WordCamp Europe actually had more people than WordCamp US this year, which Matt took as a personal challenge for Nashville. WordPress.tv published 26% more talks this year than the previous year, and now there is an official WordPress channel on YouTube, so more and more videos will begin to be available wherever people want to watch them. More than a year ago, work began to separate WordCamps from the WordPress Foundation, in order to make WordPress event organizing more flexible and to better protect the WordPress trademarks that the foundation holds. One of the things the foundation is going to start doing is support like minded non-profits, and in 2017 will be sponsoring three: Hack the Hood, the Internet Archive, and Black Girls Code. Also, the foundation will start to promote hackathons for non-profits and NGOs. Matt gave a shoutout to WordPress’s “cousins” like BuddyPress and bbPress, highlighting a lot of features that have gone into the software in the last year. WordPress.org itself uses BuddyPress and bbPress. For ages, it’s used outdated versions of bbPress, and in the past year launched a new support form that uses modern bbPress and WordPress profiles use bbPress. Matt says projects like these will get new support and engagement over the next year. HackerOne is a security website that allows software organizations to offer bounties to hackers for responsibly disclosing security bugs. GlotPress has had a big transformation in the last year, as it is no longer standalone software on top of BackPress, but rather a plugin for WordPress. If you’ve never been to translate.WordPress.org, you’ve seen GlotPress in action, and it’s pretty amazing. WordPress.org is a central hub for the WordPress community. Matt highlighted some of the work that’s been going on this past year around languages, support forums, and more. He also says that new work will be going into P2/O2, which are used for the Make WordPress blogs. And he gave attention to the new WordPress plugin repository, which finally uses WordPress itself, and has a whole new design. You can see the new design in action on the new demo site, which should role out to the main Plugins directory soon. WordPress 4.6 was available in 50 languages the day it was released. And the top 10 plugins are 82% translated in the top 12 languages used in WordPress. Language packs have been a huge help in helping translate plugins as a community project on Translate.WordPress.org, rather than having to ship translations inside the plugin itself. 1,598 plugins are now using language packs, and 1,224 themes use them. This is huge for the future of WordPress working great in every language. Also, in WordPress 4.7, we’ll see per-user language choices. Matt recently posted about a WordPress Growth Council to help WordPress grow and maintain marketshare. He says that what got WordPress to where it is today, won’t get WordPress to where it can be tomorrow. He blogged about this new growth council, which folks can apply for, which will help guide product direction in WordPress going forward. Matt actually said in Post Status Slack recently that if WordPress doesn’t make changes to the interface and otherwise, he’d expect WordPress marketshare would begin to decline by 2018. 11.45% of WordPress websites are now served via HTTPS. Matt talked last year about how LetsEncrypt and PHP7 were going to be a big deal, but they’ve turned out to be, “huge.” And WordPress will now start applying progressive enhancement techniques for WordPress websites. WordPress.com is now fully on PHP7, which he says was an enormous accomplishment. He’s also announced that WordPress.org will now recommend PHP7 by default. Matt gave some updates on Calypso’s adoption since it was released last year. He says that 68% of posts on WordPress.com are now written in Calypso. 17% of posts are written via a mobile device, and only 15% of users are using the WordPress admin. For reference, Calypso is the default method of publishing on WordPress.com now, so that includes the desktop website, desktop app, and mobile app. Matt says that building Calypso is like, “building a plane while it’s flying.” And while it’s hard, he says it’s worth it, but it’s like rebuilding WordPress — which took 13 years to do — in only two years. The future of Calypso includes making it “plugin aware”, so that prominent plugins (most Automattic plugins included) would be recognized and manageable via Calypso. In fact, Calypso is plugin aware today, as the merge has just happened. So now plugins can include custom code to be manageable via Calypso. This is an interesting move to me, especially since Calypso — while open source — isn’t an official WordPress project, but rather an Automattic-owned interface. Matt says that someday he’s like to see Calypso, “or something like it,” eventually to become the WordPress interface. WordPress 4.5-4.7 will have been released by the end of 2016. Matt says, “this is very much a year about doing things differently.” And in that spirit, he’s pre-announcing the jazz musician in the release. I’m sure Jeffro will be pleased 😉 WordPress 4.7 will be named “Vaughan”, after jazz musician Sarah “Sassy” Vaughan. Helen Hou-Sandi came to the stage to discuss WordPress 4.7 in more detail. WordPress 4.7 will include a variety of features, and will be released on Tuesday, December 6th. WordPress includes a new default theme that with a multi-section home page that’s a brand new WordPress feature. And generally Twenty Seventeen has a lot more broad base appeal for businesses and non-blogging applications than many past themes. Helen really wanted to focus on user interactions in WordPress 4.7. She used the example of her “tweet storm” about what it’s like to change a theme, which took dozens of steps and included a lot of unclear processes. Themes in 4.7 can define content that ships with the theme, such as a nav menu setup, sample page content, a password protected page, and other content that would be utilized in the theme. This will be a massive improvement in the initial theme setup experience that I love to see in 4.7. WordPress 4.7 includes better menu building that will also assist the new user experience. Now when you are building a menu in the customizer, you can add a page right from the menu screen, so that if you haven’t yet written your “about” page or whatever else, you’ll be able to create that draft straight from the menu screen, so the user doesn’t have to know exactly which flow is necessary to setup their site. Helen highlights sleeper features, like thumbnail previews for PDFs and user dashboard languages so a user can use a different language than is set by the site administrator. To big applause, Helen noted the inclusion of the WordPress REST API Content Endpoints in 4.7. She says that she’s excited to take the momentum and excitement around the API and turn it into more real-world projects where people test and put it to practice. Jeff Paul and Aaron Jorbin were the deputy release leads for 4.7, and more than 475 contributors submitted code to 4.7. Over 200 of those contributors are first time contributors. To end the preview of WordPress 4.7, Helen shared a sneak preview of the WordPress 4.7 video, created by friend Rami Abraham, that highlights “Carly”, who is a small business owner building her business website. The video shows a couple more great sleeper hits, like customizer preview icons to help editing, and video headers. WordPress 4.7, I believe, is going to be one of the best releases we’ve seen in a long, long time. It’s jam packed, and while I’m sure we’ll have plenty of follow-on work, there’s been a hugely ambitious effort with tons of awesome contributors. None of it would’ve happened without Helen. After the video, Matt came back on stage. Matt highlighted some of the REST API examples, including the new Guggenheim Museum website and Vocativ, which both use the new API, and are powered by Content Endpoints. Matt spent a few minutes reflecting over this past, and busy, year; but also spent time discussing the past few years and what’s in store in the future. Matt recognized the “predictable” release cycle that we moved to around WordPress 3.8, and how that’s been a huge benefit for the platform in general. He says, “What can we try next?” In other words, he wants to do things differently going forward: “What got us here, won’t get us there.” In order to do this, he’s proposing a new structure for core development. In 2017, Matt says he’s going to be a heavily involved project lead again. Matt sees powering the WordPress admin with the REST API as a core focus for 2017. In addition, this effort will include shipping authentication tools in WordPress core, so that external applications can connect to WordPress websites. He says if we can’t move forward with this goal, then we need to consider making the API a plugin again. Matt wants to see a lot of work on the WordPress editing experience. Matt says he showed “block-baced editor” (some may remember this as “content blocks”) in a State of the Word slide a few years ago, and calls the WordPress editor his “white whale”. He says we need to be candid about our shortcomings with WordPress so that we can more effectively move forward. Andrew Ozz and Ella Iseulde Van Dorpe have been massively influential on the editor improvements we’ve seen over the past few years, and their contributions will be huge for moving this goal forward. “The customizer is not yet fast enough, and flexible enough, to meet our current needs.” He’s excited to see all the new work going into the customizer, but knows there’s a lot of work to do to take the customizer to the next step. He says that new major versions of WordPress will not be released until these features are ready. He says that as each project is completed, there will be a major release to go around it. I’m fascinated by this new approach. It’s like taking the current feature project framework and taking it multiple levels up. It’s definitely a way to shake things up, and that may be great, considering so many people in the WordPress space enjoy complaining about the slow process that is WordPress feature development. Matt, as project lead, says he’ll personally be taking these on as the lead. And work will begin immediately to make it happen. So, I don’t know if the next release will be called WordPress 4.8, or when it will be, but I’d be shocked if it’s four months like past releases. But I guess we’ll see a lot of minor releases for all the other aspects of core development. Matt says he thinks we’ll fall while we learn to walk in this new way, and that’s okay. I have to admit, these are some pretty surprising announcements. I’m excited to dig more into the particulars over the coming weeks, but I do think this serves as a worthwhile and important jolt into WordPress core development. That’s not to say I think WordPress development has been bad, I think it’s been great. Matt finished by reading a poem by Elizabeth Alexander, titled, “Praise Song For The Day” that marked a fitting end to the talk. I think the key takeaway should be like he said: “what got us here, won’t get us there.” Let’s see how this goes. Photo credit: Brian Richards for Post Status. As a one-dev theme/plugin shop owner, the past 2 or so years of releases has been tough on me. I’ve felt like features have been all over the place, and we’ve all just been chasing the deadline. I don’t have time to actually use a feature I just learned before several new, unrelated features are ready to learn. A tighter focus on major features seems like something that’d get me excited about core dev again. It takes a lot of time to edit the videos and to upload them. Also, I think, a lot of WordCamp organizers, in non-english communities, think that they can’t upload videos if they are not in English. So, there is a lot of work to do in that aspect and that’s why there is a WPTV team in make.wordpress.org for helping on it. Some talks are really are just discussions. It would be hard to turn all that into features or/and they are surely prioritising even if a specific feature is considered in an upcoming release. As with all things WordPress, it depends on volunteers. WordCamps have to make sure the talks are recorded to get submitted to WordPress.tv, which means either using sponsorship money for a Videographer or getting someone to volunteer. Then you also need to get those videos uploaded to WordPress.tv somehow. I’m sure as WordCamps grow in size and popularity this will become more prevalent, but 26% is a pretty high number. 1 – Not all WordCamps record the sessions. I would think most do at this point, but some don’t. 2 – I don’t know if Meetups are counted in that number, but very few Meetup talks make it to WPTV. Case in point, we record all of ours but have yet to submit any to WPTV (though we hope to in 2017). If someone else has more concrete info about why, I’d love to hear it. In some cases it could be man power. It takes volunteers to process the video and I often see calls out for more help. It was great to be a part of the event. The REST API will be the game changer! This is huge. This basically means WP is the only software (ever to my knowledge) to broach this honestly and directly, rather than constantly down-play critique. Not only will this mindset improve the product if genuine, but it may be the secret sauce to ensure it’s around in 10 or 20, even 50 years because it has larger aspirations and is not going to go full-limpet pretending things should never change or be done the way they are now. * allowing SSO or similar “enterprise ready” features like multi-site orchestration without WP multisite. I’d also love to know how Automattic is going to steer WooCommerce since acquisition as it’s a great product, I’d love to see it grow and replace magento (because that is a pile like Joomla was for CMS, now Joomla who?). I suppose at the end of the day it’s not a sprint, it’s a marathon and it’s lovely to be witness to. I’m slightly worried that the new release system will hold smaller new features hostage until the major features are ready for release. Eg, it sounds like Matt wants to have a release focused on REST API improvements, like maybe 4.8. So if someone adds a patch that makes some minor improvement (but not critical bug fix) to an action, when will that get released? Will it be put into a security release? Probably not. Will it just sit on 4.8 release until the REST API improvements are considered “done” (which can be moving target, especially with the inevitable feature creep). This different release process sounds like it will help focus on those major features, but hold other smaller features hostage until they’re done. Am I missing something? Nice write-up on the State of the Word! One part about Twenty Seventeen is technically incorrect. WordPress includes a new default theme that with a multi-section home page that’s a brand new WordPress feature. The multi-section home page is powered by options available only in Twenty Seventeen, not WordPress. Lots of people worked hard to bring something similar for core this release, but it wasn’t quite ready. See #37974. Hopefully, thanks to all the great momentum created during 4.7 around themes, work on theme-related features and improvements can continue in a big way. First, thank you for the quality of this report (as usual I might add). It seems that caring about the current growth trend of WordPress is definitely a good thing. Being able to say that what we’ve done until now may not be what we have to do in the future is also great. My experience tells me that the UI of WordPress is one of its major advantage over competitors. I understand that stability along with retro-compatibility are also very attractive to WordPress users. But from time to time, we have to innovate. However, another great advantage of WordPress may be endangered in this process: its extendibility (ie. the capacity to extend WordPress with plugins with a very low technical cost). I have been surprised that State of Word didn’t mention at all what is a major contributor to the WordPress success: its ecosystem (including paid products). I hope that coming features will take in account the needs of the numerous companies proposing great plugins and addons. It would a pity to break the plugins and themes ecosystem. That said, I find that using the API for admin would be a great way to solve the issue of the WordPress legacy code (which drives so many non WordPress developers to say that it has to be rebuilt from scratch – which BTW I don’t agree at all). 90% of the plugins & themes my customers use have to be replaced or augmented; because quality is in the toilet! This is often more expensive and time-consuming than it needs to be for them and for us (as we get paid and need to pay staff and suppliers too). Marketplaces including big-players like envato and the WordPress plugin repo have huge quality issues, and customers are suffering as a result. Actually I’d like to see WP clamp down on plugin and theme quality as I think it would raise their profile a lot, but also more resources for buyers so I don’t have to be the boring expert conducting pre-works checks to see what we are working with! WordPress itself is very clear about why a plugin is great, and why a theme is great and popular plugins like WooCommerce show their maturity by allowing the plugin to have elements theme overridden, providing hooks for filters and actions. At the end of the day you may still have to augment, but at least chance is lower. This should be a thing for plugins also. Sure thing support WooCommerce (after all they own it now), but also promote what they have done well, what others should learn from. Educate that ye a $15 plugin might cost $2000 to rewrite or augment because off-the shelf leverages economies of scale that bespoke cannot! We just had to augment “WooCommerce – Gift Cards Pro” WP-Ronin and “WooCommerce Currency Switcher Pro” realmag777. Gift cards edits was largely using hooks, which is cool, we love well authored plugins that do weird things (in customers eyes), but can easily be filtered, extended and augmented. I absolutely do not wake up and think (gosh I’d like to alter someone else hard-work today). The currency switcher was atrocious! For the record we didn’t re-build either. It’s not our responsibility if the plugin had an in-built problem, just our responsibility for the bits we add; but in-order for us to add these it seems a lot more work and it’s another plugin, more hooks which eventually makes a websites performance suffer, even if as we do you use transients, cache a lot etc. Also the person that installed that plugin… They are and should be on the hook for it’s operation. The author often is not as they just shrug and respond every N days. There are two-sides and WordPress has to support both, but the assertion plugin devs do a lot to support themselves (even premium) I find false.